"The age of stone is over!" Studiocanal UK has debuted the full-length official trailer for Aardman's new stop-motion animated movie Early Man, telling the story of how an early cave man and his friend, a wild boar named Hognob, unites his tribe against the mighty Bronze Age in a battle to beat them at their own game. The first teaser trailer didn't show much but this one finally gives us a good sense of the story - which looks to be about the old vs new, fighting against change, in a way. The primary voice cast features Tom Hiddleston, Eddie Redmayne and Maisie Williams. I'm so glad that Aardman is still making movies, they're always so fun. This looks amusing and perfectly British with the soccer (er, football) stadium scenes. You can still watch the first teaser trailer for Aardman's Early Man here, if you want to go back and see it. Set at the dawn of time, when dinosaurs and woolly mammoths roamed the earth, Early Man tells the story of how one plucky caveman unites his tribe against a mighty enemy and saves the day! 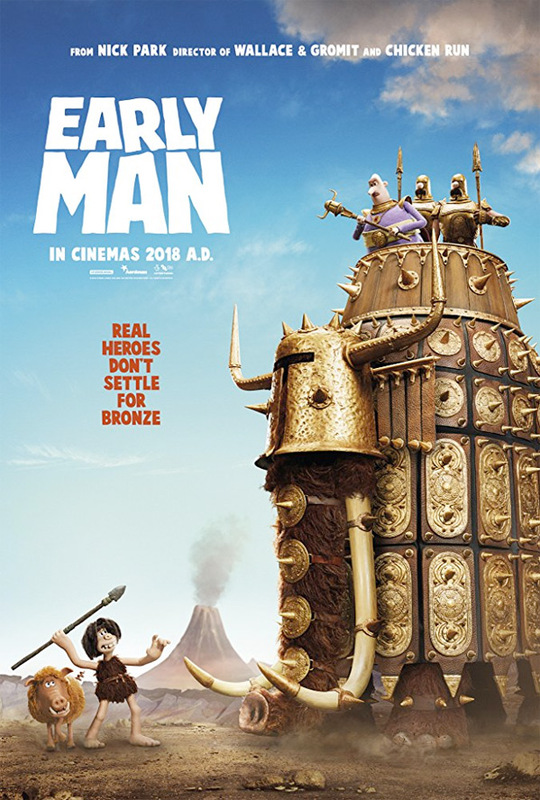 Aardman's Early Man is directed by veteran Aardman filmmaker Nick Park, of many old Wallace & Gromit movies previously, as well as Chicken Run, The Curse of the Were-Rabbit, and A Matter of Loaf and Death. The screenplay is written by Mark Burton, James Higginson and John O'Farrell. StudioCanal will release Early Man in theaters in Europe in early 2018. No US release date is set yet. For more, follow @earlymanmovie.